4 Tbsp. butter or olive oil or both! Chop and sauté red pepper, Serrano pepper and jalapeño pepper together on med-high heat with olive oil or butter. Add minced garlic towards the end of the sauté and reduce to med/med-low heat. Combine crabmeat, Monterey Jack cheese, mozzarella cheese, cheddar cheese, green onions and garlic in medium bowl; squeeze 1/2 of lime over ingredients and mix well. Spread about 1/2 cup mixture and sliced avocado onto 2 tortillas; sprinkle evenly with remaining Monterey Jack cheese. Melt 1 tablespoon of butter on cast iron griddle over medium-high heat. Add one quesadilla; cook for 2 minutes on each side or until golden brown. Cut each into six wedges. Serve with Sriracha Wasabi sour cream for dipping. In a medium-sized mixing bowl, add all ingredients except the beer. While whisking, start to incorporate the beer by adding 1/2 cup first and then more to thin out as necessary. Start by whisking together the cheese, herbs and seasonings in a small mixing bowl. Load the cheese mixture to a piping bag or sandwich bag with a corner cut off. Gently squeeze the mixture into open blossoms and twist tops to close. To view a step-by-step video for making the gluten-free beer batter, visit GlutenFreeInRichmond.com. In a large pot bring the water or vegetable broth to a boil. Once it is boiling turn down the heat and keep it at a simmer. You will use this liquid to add to the rice one cup at a time until it is all absorbed. Do not rinse the rice beforehand, in doing so you will wash away the starches that help make risotto creamy. In a large sauté pan, warm the olive oil over low heat. Add the garlic and shallots and cook for about 5 minutes or until they start to lightly brown. Then add the rice and stir well. Cook for about 3 minutes. Ladle 1 cup of the liquid into the rice mixture and simmer, stirring occasionally until the liquid is absorbed. Repeat this step, adding 1 cup of liquid at a time until the rice is cooked through but still a tad firm. This will take about 35-45 minutes total. You may not need to use all of the liquid or you may need to use a little more, just keep adding until you get a loose and creamy texture. Cut asparagus into bit sized pieces and steam until a bright green color develops about 3-4 minutes. Do not overcook. Combine all of the pesto ingredients together in a food processor and pulse until blended smooth. Spoon a generous dollop of pesto onto the risotto and enjoy! 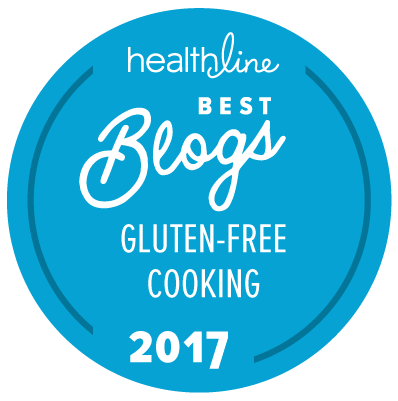 Stay tuned for the free downloadable eCookbook, featuring the top recipes from the Gluten-Free Choices Spring Recipe Contest! Be one of the firsts to get your copy by signing up here. Stir tomato sauce, onion, garlic, vinegar, agave, tomato paste, paprika, mustard, chili powder, and salt in a 6 quart slow cooker. Add chicken thighs and stir to combine. Cook on low for 5 hours or until chicken thighs can be easily shredded with a fork. Transfer chicken to a cutting board and shred. Return to the slow cooker and stir well. Serve as sandwiches, in omelets, in tacos, or any other way that makes you smile. Cook the pasta in salted water, per instructions. Set aside. Place bresaola or pancetta in a large sauté pan. Cook 2-4 minutes over medium-high heat until golden brown. Add onion and cook until translucent, about 3 minutes. Place tomatoes, capers and olives into pan, sautéing and stirring 3-4 minutes. Remove from heat. Add basil and arugula and cooked pasta to the mixture. Toss together well. Serve in bowls, drizzle with olive oil and season with salt and pepper.